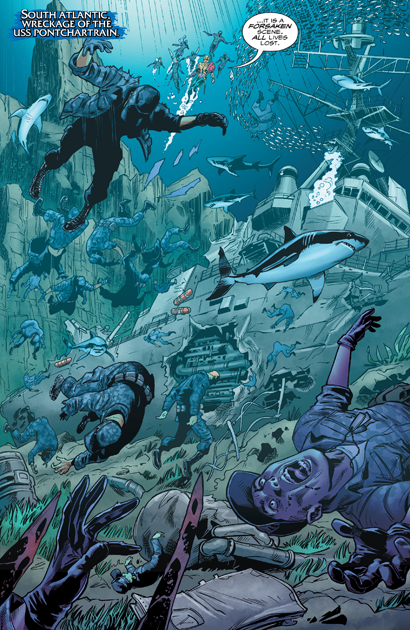 "The Drowning Part Four: Semper Fidelis" by Dan Abnett, Philipe Briones, and Gabe Eltaeb. 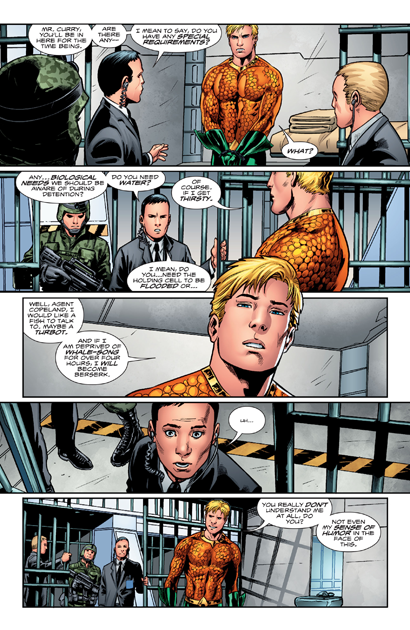 Aquaman allows himself to be arrested and imprisoned, thinking it will tamp down the escalating tensions between Atlantis and the U.S. Government. Mera consults with Tula, who is investigating the situation from their home base. The mysterious group known as N.E.M.O. (headed by a woman named Black Jack) transports Black Manta to meet their leader. 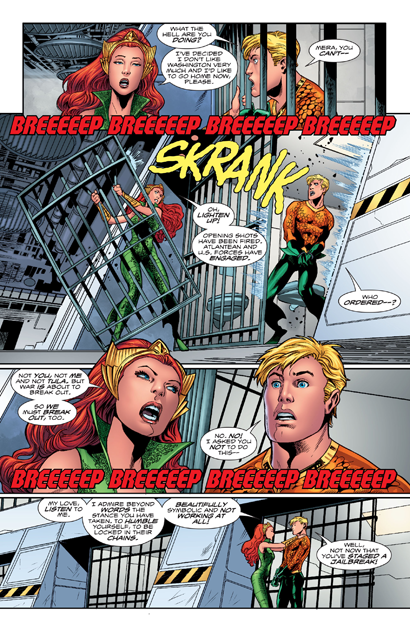 Mera, tired of waiting for the Surface World to see the truth, breaks Aquaman out of prison. They escape long enough to find themselves surrounded by armed forces, all of whom are pointing their weapons at our heroes. 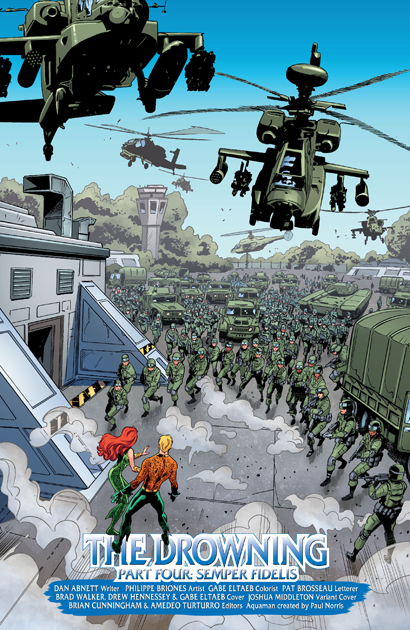 Writer Dan Abnett is clearly channeling real-world events in both Britian and the United States, with Aquaman's discussion about how a small subset of Atlanteans "fear change" and have turned angry and violent. He (Aquaman) even seems a bit sympathetic, but all that has to be set aside when Mera comes charging in. I enjoyed Mera's exasperation with her beau, who reminded me a bit of Superman in Kingdom Come, so determined is he to Do The Right Thing. It's an interesting idea, to have the book's main character not be the one who drives the action, but then Arthur has always been a bit stubborn, sometimes to his own detriment. I didn't mention this last issue, but I'm tickled that writer Abnett has chosen "Black Jack" as the moniker for this new villain. For those Golden Age Aquaman fans, Blackjack was of course the moniker of pretty much the only recurring bad guy the Sea King ever faced. As a bad guy, he was a miserable failure, and this new version has already outperformed her namesake by managing to break Black Manta out. I can only assume this was on purpose--if so, I enjoy the little nod to Aqua-History. After being lukewarm on Philipe Briones' work last issue, I was much more enthusiastic about it here. All the scenes in Atlantis with Tula are filled with visual invention, and Mera gets a good amount of distinctive facial reactions that reminds one a bit of the work of Kevin Maguire. I don't think he's quite got a handle on Aquaman yet, but the rest looked pretty nifty, and he can stage action sequences well. 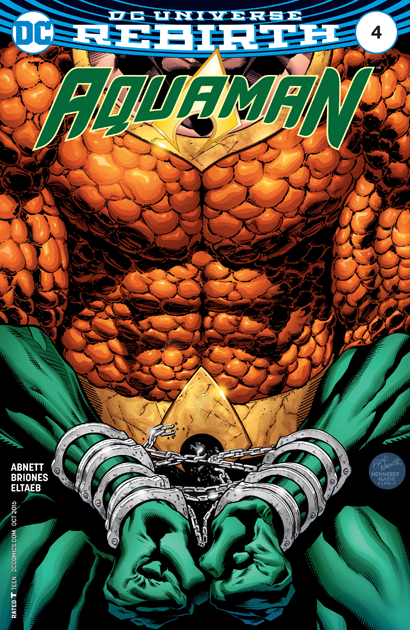 My apologies for the late review of this issue, Aquaman's increased publication combined with Olympics Fever (where I'm following a real life Aquaman) has really thrown a monkey wrench into my Shrine posting schedule. 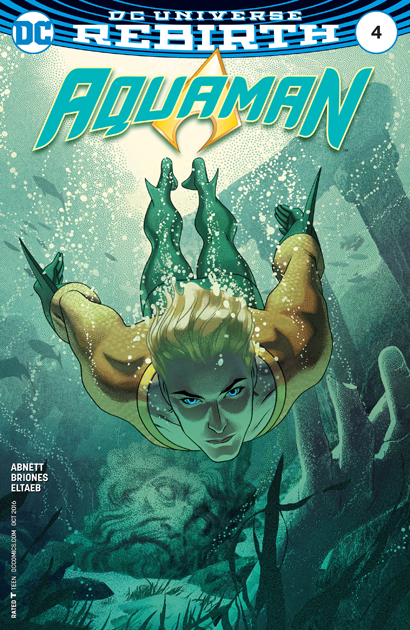 Aquaman #4 is on sale now! Why isn't brad walker doing the art. He was the big name dc pushed.